You've heard the stories and you've seen the images of police escorting students out of school to be involuntarily committed for a mental health evaluation under what's known as Florida's Baker Act Law. But nearly one year after the Parkland shooting inspired schools to improve mental health services to kids in crisis, we found many school districts fail to track how many of their students have been Baker Acted and many lack independent policies on how to handle these cases including policies to contact parents before a Baker Act is initiated at school. An Orlando father who we're not identifying by name to protect his child, said the school did not contact him last year before police Baker Acted his 10-year-old son after the boy said he wanted to hurt himself. "All of this is happening without us being given the opportunity to go first to the school and speak to our kid or just get him out of school," he told us. While the Baker Law lets police transport someone they believe poses a threat to themselves or others due to a mental illness to a mental health facility for an involuntary psych exam, his son has autism, not a mentally illness say experts. "He does not experience the world the same way you and I are who are not on the spectrum would experience," the father said. According to Florida's Baker Act Reporting Center at the University of South Florida, the number of Baker Acted kids in Florida increased 55% between 2010 and 2017. During the 2016/2017 fiscal year, nearly a quarter (21%) of Baker Acted kids were taken into custody at school according to researchers. But we've discovered many Florida school districts don't have separate school policies on how to handle these cases. In our area, the Pasco and Polk County School Districts deferred us to police, same with Hillsborough County schools. "We do not do Baker Acts, law enforcement does. 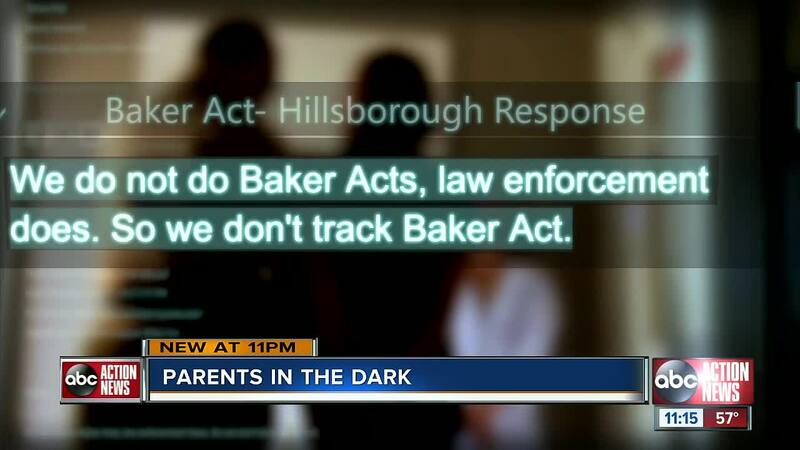 So we don't track Baker Act," a Hillsborough County School District spokesperson told us in an email. The spokesperson also told us the district doesn't know how many of its students have been Baker Acted at school. "I definitely think that they should especially if you're going to go that far with a child that's under your care and in your school district," said Florida Representative Byron Donalds, a Republican lawmaker who represents Naples. Representative Donalds currently chairs an Education Committee focused on improving public schools. He was surprised to learn the state law doesn't require schools have independent Baker Act policies or contact parents before a child is taken away. "To not know that's happening and to be told after the fact is frankly not the way to go," he said. Representative Donalds is now considering legislation to make sure parents are contacted before their child is Baker Acted. "A lot of what happens with children is simply anti-social behavior, it's not mental illness, said Diane Stein, Executive Director of Florida's Citizens Commission on Human Rights. For the last year, she has emailed letters pleading with school districts and law enforcement agencies around the state to better evaluate when a student is Baker Acted and why parents should be called before it happens. The Tarpon Springs Police Department is among the agencies revising its policies to reflect Stein's advice. Sgt. Robert Faugno said the department has seen positive changes since making the change. "I think it's common sense. Now we're directing our officers to make that contact prior to custody to try to involve them in a decision that's best for the child," he said. "Give the parents an opportunity to be a parent," said the Orlando father who chose to share his story in hope the law will change. "To this day my son still has nightmares, still wakes up in the middle of the night still saying he's going to get arrested. What good did that bring?"